Mother’s Day: got plans? As a holiday that typically revolves around brunch, it’s a busy one for restaurants. If mom prefers a more relaxed version at home (or you left it too late to make a reservation – oops), spoil her in style in the comfort of her own home. 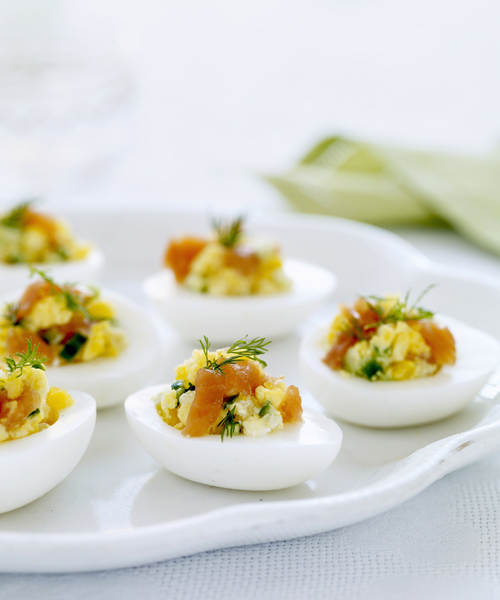 Start with these scrummy, salmony eggs from Good Housekeeping and don’t forget her beverage of choice! In 4-quart saucepan, place eggs and enough cold water to cover by at least 1 inch; heat to boiling on high. Immediately remove saucepan from heat and cover tightly; let stand 15 minutes. Pour off hot water, and run cold water over eggs to cool. Peel eggs. Place egg whites on serving dish or in jelly-roll pan lined with paper towels (to prevent eggs from rolling). Spoon about 1 tablespoon egg-yolk mixture into each egg-white half. Top eggs with reserved chopped salmon. Cover eggs and refrigerate up to 4 hours. Just before serving, garnish with dill sprigs. Where do sea lice winter?